From May 18, 2018 – August 15, 2018 one hundred ninety-three hand-painted honey bees were displayed in Dag Hammarskjold Plaza in New York City as a collaboration between artist Matthew Willey, the World Council of Peoples for the United Nations (WCPUN), New York City Parks’ Art in the Parks and Friends of Dag Hammarskjold Plaza. In September 2018 they ‘swarmed’ to Smithsonian’s National Zoo and remained there on display until November 15, 2018. These 193 bees are collectively titled Colony Expanse and are a part of Matthew Willey’s unfolding mission toward hand-painting 50,000 individual honey bees in murals and installations around the world. The Colony Expanse bees collectively represent the 193 member-states of the United Nations. They also symbolize the critical need for unity around the issue of bee and pollinator health. Each hand-painted bee was displayed outside for six months with a minimal amount of protection. They have been through storms, extreme heat and humidity, blazing sun, snow and freezing cold. Climate change and planetary health cannot be divided by socially constructed lines in the sand. Willey experiences the devastation happening to pollinators as a collective invitation to relate to the natural world differently. He uses his art and his life as mediums of connection between people and the natural world. Each painting has reacted differently to the elements telling a unique and individual story of the beauty in vulnerability, exposure, resilience, survival, perseverance, healing and change. Look closely and you will see worlds of difference between these works. Look closer still and you will see interaction between humans and nature. Works are categorized based on visible degrees of weathering. 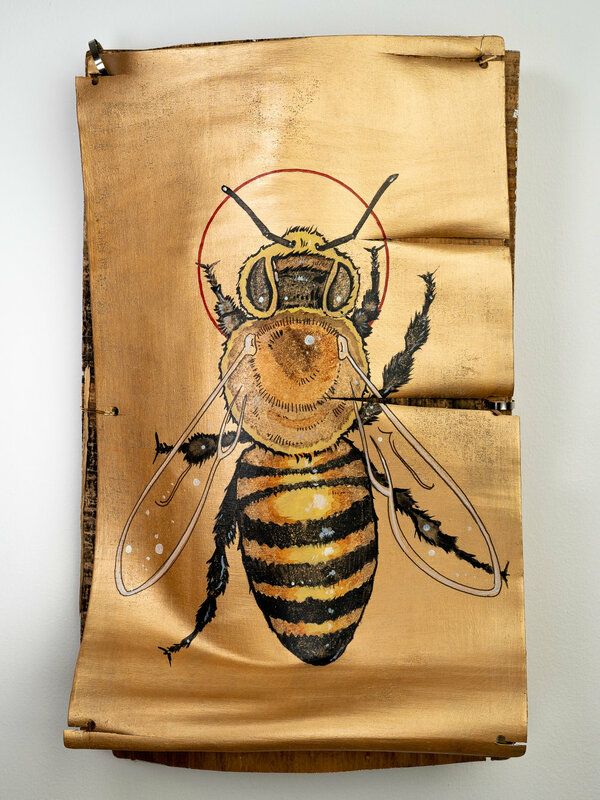 The artist has intentionally mended areas of the boards in categories B, C and D.
Art activist Matthew Willey is painting 50,000 individual honey bees – the number in a healthy, thriving hive -in murals and art installations around the world. Willey founded The Good of the Hive Initiative in 2015 to raise awareness about the importance of honey bees and in the process inadvertently started igniting widespread passion for the natural world. Twenty-one buzzing hives of awareness with over 5000 individually painted bees have been created to date. Willey has painted and exhibited bees at the Smithsonian’s National Zoo in Washington DC, Dag Hammarskjold Plaza in NYC and Burt’s Bees Global Headquarters in Durham, NC. He has collaborated with the World Council of Peoples for the United Nations (WCPUN), NYC Parks’ Art in the Parks and Friends of Dag Hammarskjold Plaza. He has spoken at the United Nations, the Smithsonian Institution, the FAO in Washington DC, Burt’s Bees, the Museum of Natural Sciences in Raleigh, NC, the Embassies of France and Germany, Duke University and countless schools. His work has been featured throughout various media platforms including the NEA’s podcast, countless blogs and periodicals including the Huffington Post and the New York Times.